Heartleaf philodendron don't like direct sunlight and handle lower levels of sunlight well making them a good choice for offices, bedrooms, or anywhere with lower light levels. Heartleaf philodendron prefer to dry out about 2-3 inches down and can handle drought well. In the Fall and Winter reduce the frequency with which you water, always check the soil by touching it to gage the moisture level before you water. Watering, more specifically overwatering, is the reason most houseplants die. To be truthful it's a bit more complicated than just overwatering. There are a lot of factors at play! You just want to love on your plant by giving it more water to drink and next thing you know it feels like your houseplant has suddenly died. I can help with that. Keep leaves dusty free by wiping them down every time you water, or at least one a month, with a damp cloth or paper towel. General POTTING MIX in a TERRA-COTTA POT. Choose terra-cotta. Terra-cotta best mimics being planted in the earth and helps to regulate the moisture levels of the soil preventing root rot. For the soil, I simply use a general potting mix, any brand will do. Soil can be a complicated topic! A lot of people have a LOT of opinions about it! When in doubt choose a general, regular old potting soil. In my book Becoming Planty, I explain my SUPER easy soil methods that take all of the stress out of potting and make is easy to keep things straight! HOUSEPLANT MIX: MONTHLY DURING SPRING AND SUMMER. A general houseplant fertilizer is perfectly fine here. I suggest using a liquid, slow release concentrate. I have used Shultz brand and really loved it. I suggest fertilizing at half strength every time you water or at full strength every other time you water. During fall I only fertilize once a month at 1/2 strength and during winter I do not fertilize at all. My favorite method is using a vase of water. Cut back your heartleaf a four to five leaves back at the nod of the plant, that little bump where the leave is growing from. The nod is where the roots will emerge from. Then place your cutting in a vase or jar filled with water so the nod stays 100% submerged in water. I pull off one or two leaves closest to the end of the cutting to prevent the leaves from mildewing in the water. Keep in water until the roots are well established, about two to four weeks. Keep in a mildly light space and away from direct sunlight. Rooting your pepper face in soil follows a similar process. Wet the tip if the cutting (the bottom 1/4 inch or so) and dip in a rooting hormone (this step isn't necessary, but it will certainly help establish stronger growth sooner) and stick into your pot filled with moist soil. Keep soil moist at all times and plant in shady, indirect sunlight being very careful to avoid direct sunlight until roots are fully established. Pictured above. With signature heart-shaped leaves and dark green foliage. Not pictured. Technically not a heartleaf philodendron, but they require the same care and look incredibly similar! They have highly variegated leaves with yellow and a rich green. Notice how the leaves have a sharper, more defined heart shape. See that cute little curl at the tip of the leaf? You won't find that on a pothos in such a defined way! 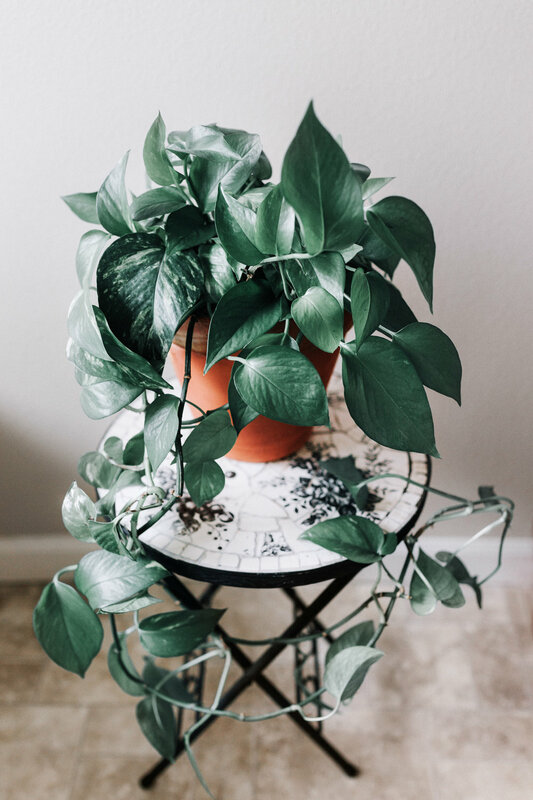 In addition, a heartleaf philodendron has a richer green color and an almost velvety appearance. Another tell-tale sign of a heartleaf philodendron vs a pothos is a heartleaf philodendron has little leaf sheaths in their trailing foliage whereas pothos does not. Their leaf shape is less defined and much less uniform. They have MUCH thicker leaves and are typically more variegated. This means not enough water. I suggest watering very thoroughly, so that water drains out of the bottom. Allow all access water to drain. The water again when the top 2-3 inches of the soil is dry. Usually overwatering. It can also mean you are moving it around too frequently, or that the temperature and humidity levels are changing too often. Your plant isn't going to die! This simply means it isn't getting enough sunlight to sustain the coloring and is adapting to its environment by creating more chlorophyll. If you want the variegation back increase sunlight. If it doesn't bother you don't worry about it. Typically a sign of under watering, though it can mean overwatering.